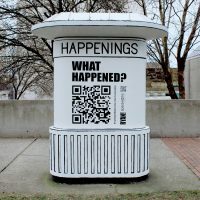 The Happenings Kiosk began as a Call for Submissions, directing the viewer via QR code to a submission form to contribute text and images based on the prompts: What Happened? 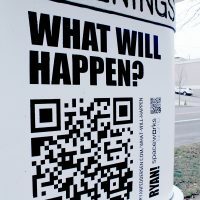 and What Will Happen? 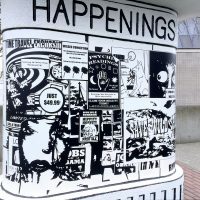 Inspired by the words, ideas and pictures submitted, The Happenings Kiosk was transformed into a modern tribute to- and satire of- it’s original purpose- a community bulletin board. 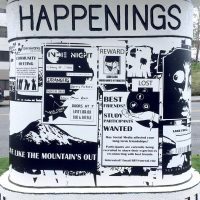 The “bulletins” are inspired by the submissions, but transformed to create a variety of posts that include formats: announcements, flyers, advertisements, news clippings, business cards, hand-written notes, and events- anything you might find on a physical bulletin board. They include factual posts, but also deliberate fabrications. 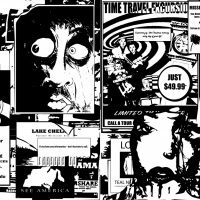 The lines between reality and the imagination are heavily blurred- similar to our current digital landscape of information, but reapplied to a very IRL predecessor.